Ladies 15 1/2" wide white display hanger that is 1 1/2" thick, with a 4" chrome plated hook and a 10" heavy wire drop with polished metal spring loaded clips and vinyl inserts. Perfect for displaying or highlighting sportswear and coordinates. Also available with 2" or 10" skirt drop attachment. These hangers are also available with 6" long hook. Hooks are also available in black and gold. Also available with 2" or 10" skirt drop attachment. 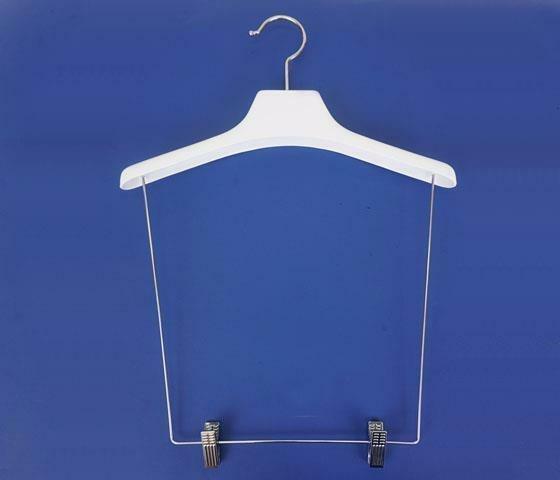 Perfect for me's or ladies sportswear.Hangers also come in white,gold,beige and pewter. On 100 hangers or more, custom print your logo or name on these hangers at no charge. Call our printing department at Ext.104 for easy set up. Minimum order 50 pieces.